Collaboration is a must in these austere times, where fishermen hold the key to new streams of data – for fish stocks, the fishing industry and the wider marine environment. 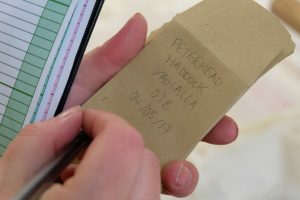 The Fishermen-Science Interface Programme (FSIP) brought together – and initiated dialogue – among some of the key and forward-thinking fisheries scientists and fishermen in the UK, with the intention of making industry data salient and credible to inform fisheries management and policy. The FSIP was devised in partnership by FitF and the Centre for Environmental, Fisheries and Aquaculture Science (Cefas). 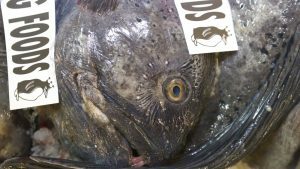 It was delivered by key personnel at these two organisations, and was led by Dr Steve Mackinson from the Scottish Pelagic Fishermen’s Association (SPFA). It was funded entirely from the outset by Seafish through their Strategic Investment Fund (SIF). 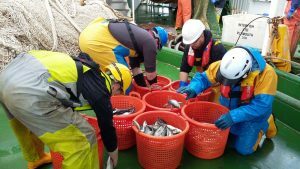 Fishing into the Future was established as a charity in January 2015, with a mission to “Chart a course toward sustainable and prosperous UK fisheries”. To support the development of the charity, strategic planning was required to ensure it crystalised its areas of work in to themes that were coherent, pragmatic and fundable. 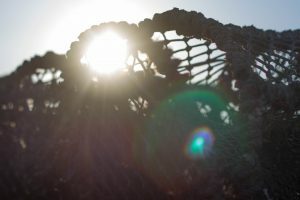 A series of meetings and workshops led to the development of the relevant Business Plan, and built some solid foundations on which Fishing into the Future could grow. This process has been helped enormously through the involvement of some nationally and internationally important trustees, as well support from global organisations such as the International Sustainability Unit – one of the Prince of Wales’ Charities. Producing a suite of Guidelines for Industry Science Data Collection was the primary objective for this project, and the most complex undertaking. The issues are hugely complex: the call for ‘Big Data’ is increasing – but funds for independent research are going down – the only sector capable of adding capacity to this over-stretched system is the fishing industry itself. Fishermen set-sail on potential ‘research platforms’ each time they leave harbor. Likewise, with an eye for quality control, factories can be efficient biological sampling platforms. Harnessing this potential for the good of fish stocks, the environment and society will be vital for the way our seas are managed and will contribute to ensuring we have ‘seafood security’ for future generations. The Guidelines provide a small step on the road to achieving this ambition and placing industry-generated data on a par with other formal data sources. 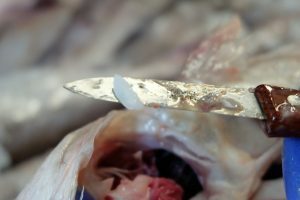 Engagement in fisheries science by the UK Channel scallop fishery has been undermined in recent years through the shortcomings of projects such as the red-bag scheme. To overcome this, and to move toward a formal stock assessment for one of the most valuable – and vulnerable – stocks in UK waters, involving the industry from the outset was necessary. Through a process of workshops and meetings, run in partnership with Cefas and the South West Fish Producers Organisation (SWFPO) and Brixham Trawler Agents, the Fishermen-Science Interface Programme was able to bring together key figures at the start of a journey, which has since inspired further work and engagement. We delivered across all three main elements of the project. We instigated a process of collaborative working between the Channel scallop fleet and fisheries scientists as they work toward a full and formal stock assessment for scallops in the area for the very first time. Develop a UK-wide Strategy for Industry Data Collection. This will require additional funding and we will be working up project proposals in partnership with other agencies over the next 12 months.